Attend any installation or organizational judge advocate general-sponsored ethics training (ETH 004). Complete Defense Acquisition University’s (DAU) Overview of Acquisition Ethics Continuous Learning Module (CLM 003). Complete DAU’s Ethics at Work Continuous Learning Module (HBS 415). Watch DAU’s 16-minute online Ethics Video (ETH 004). Once the ethics training requirement is complete, be sure to capture it in CAPPMIS-IDP, using one of the following titles to receive credit: CLM 003; HBS 415; ETH 004. Now is the time you’ve been waiting for! Annual Senior Rater Potential Evaluations (SRPEs) for FY17 were pushed to all GS-12 to GS-14 and broadband equivalent AAW raters and senior raters on Oct. 1. Fear not: you’ll find plenty of resources for completing SRPEs here. This Just In! Check out the October – December edition of Army AL&T magazine. Coming Soon: the October DACM Newsletter. Opportunity is knocking! 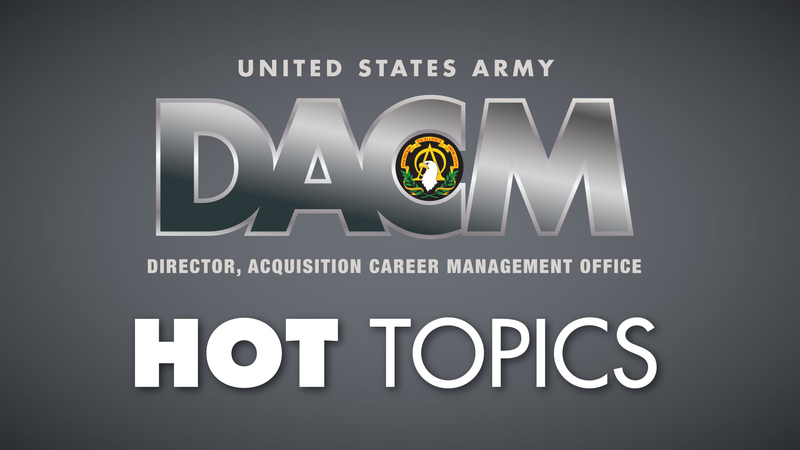 FY18 Consolidated acquisition, training and education program timelines and announcement dates are now available. DOD acquisition, technology and logistics career field certification standards are normally implemented on Oct. 1 each fiscal year. Some certification and course changes are taking place in the current FY17. The consolidated changes are outlined in the following table. For career fields not listed in the table, there are no approved changes to date. For certification considerations under the FY17 standards, workforce members must have submit their certification applications by midnight, Sept. 30, 2017. Applications submitted after Oct. 1 will be held to FY18 standards. Current career field certification standards required for all acquisition positions can be found at Certification and Core Plus Development Guides. Change effective March 1, 2017 1 BCF 131 – Applied Cost Analysis (R) BCF 107 retired Feb. 27; valid predecessor course until Oct.1, 2018. Change effective 1QTR 18 1 BCF 110 – Fundamentals of Business Financial Management (DL) BCF 103 retires 1QTR 18; valid predecessor course until Oct. 1, 2018. Change effective 4QTR17 1 BCF 130 – Fundamentals of Cost Analysis (DL) BCF 106 retires 4QTR 17; valid predecessor course until Oct. 1, 2018. Change effective March 1, 2017 2 BCF 230 – Intermediate Cost Analysis (R) BCF 204 retired Feb. 28; valid predecessor course until Oct. 1, 2018. 6 years of acquisition experience with 5 of the 6 in cost estimating 7 years of acquisition experience in cost estimating. Change effective March 1, 2017 3 BCF 330 – Advanced Concepts in Cost Analysis (R) BCF 302 retired Feb. 28; valid predecessor course until Oct. 1, 2018. Change effective 4QTR 17 1 BCF 130 – Fundamentals of Cost Analysis (DL) BCF 106 retires 4QTR 17; valid predecessor course until Oct. 1, 2018. Change effective 4QTR 17 2 BCF 130 – Fundamentals of Cost Analysis (DL) BCF 106 retires 4QTR 17; valid predecessor course until Oct. 1, 2018. Change effective Jan. 1, 2017 2 EVM 202 – Intermediate Earned Value Management (R) EVM 201/BCF 203 retired; valid predecessor courses until Oct. 1, 2018. Change effective Oct. 1, 2017 1 CLM 059 – Small Business Program for Contracting Officers (DL) CLC 025 retires Oct. 1, 2017; valid predecessor course until Oct. 1, 2019. Change effective Oct. 1, 2017 3 CON 320 – Advanced Indirect Cost Analysis (R) CON 232 retires Oct. 1, 2017; valid predecessor course until Oct.1, 2019. Change effective 1 QTR FY18 2 ENG 201 – Applied Systems Engineering in Defense Acquisition, Part I (DL) SYS 202 retires 1QTR FY18; valid predecessor course until Dec. 31, 2018. Change effective Oct. 1, 2017 1 LOG 100 – Life Cycle Logistics Fundamentals (DL) LOG 101 retires Sept. 30, 2017; valid predecessor course until Oct. 1, 2019. Change effective Oct. 1, 2017 2 PMT 252 – Program Management Tools Course, Part I (DL) PMT 251 retires Sept. 30, 2017; valid predecessor course until Oct. 1, 2018. PMT 360 – Program Management Office Course, Part B (R) PMT 352A and PMT 352B retired April 30, 2017; valid predecessor course until Oct. 1, 2019. Change effective 1QTR 18 3 BCF 110 – Fundamentals of Business Financial Management (DL) BCF 103 retires 1QTR 18; valid predecessor course until Oct.1, 2018. Change effective 1QTR 18 3 ENG 201 – Applied Systems Engineering in Defense Acquisition, Part I (DL) SYS 202 retires 1QTR 18; valid predecessor until Dec. 31, 2018. Change effective 1QTR 18 2 ENG 201 – Applied Systems Engineering in Defense Acquisition, Part I (DL) SYS 202 retires 1QTR 18; valid predecessor until Dec. 31, 2018. Course name changes occur as a result of updates to course content. Predecessor courses to a new course are not always valid indefinitely and may have near-term end dates. To view details of new courses and valid dates of predecessor courses, please see the DAU iCatalog or the DAU consolidated predecessor listing. None ACQ 255 deploys Oct. 1, 2017. BCF 110 (DL) – Fundamentals of Business Financial Management BCF 103 – Fundamentals of Business Financial Management BCF 110 deploys 1QTR FY18. BCF 103 valid predecessor course until Oct. 1, 2018. BCF 130 (DL) – Fundamentals of Cost Analysis BCF 106 – Fundamentals of Cost Analysis BCF 130 deploys Oct. 1, 2017. BCF 106 valid predecessor course until Oct. 1, 2018. BCF 131 (R) – Applied Cost Analysis BCF 107 – Applied Cost Analysis BCF 131 deployed Feb. 27, 2017. BCF 107 valid predecessor course until Oct. 1, 2018. BCF 230 (R) – Intermediate Cost Analysis BCF 204 – Intermediate Cost Analysis BCF 230 deployed March 1, 2017. BCF 204 valid predecessor course until Oct. 1, 2018. BCF 250 (R) – Applied Software Cost Estimating None New BUS-CE, Level 2 certification course. BCF 330 (R) – Advanced Concepts in Cost Analysis BCF 302 – Advanced Concepts in Cost Analysis BCF 330 deployed March 1, 2017. BCF 302 valid predecessor course until Oct. 1, 2018. CMA 241 (R) – Government Flight and Ground Representative (GRF/GGR) CMA 211 – Government Flight Representative and CMA 221 – Joint Ground Government Flight Representative CMA 241 replaces both CMA 211 and CMA 221. CON 320 – Advanced Indirect Cost Analysis CON 232 – Overhead Management of Defense Contracts CON 320 deploys Oct. 1, 2017. CON 232 valid predecessor course until Oct. 1, 2019. ENG 201 (DL) – Applied Systems Engineering in Defense Acquisition, Part I SYS 202 – Intermediate Systems Planning, Research, Development, and Engineering, Part I ENG 201 deploys 1QTR FY18. LOG 100 (DL) – Life Cycle Logistics Fundamentals LOG 101 – Acquisition Logistics Fundamentals LOG 100 deploys Oct. 1, 2017. LOG 101 valid predecessor course until Oct. 1, 2019. PMT 252 (DL) – Program Management Tools Course, Part I PMT 251 – Program Management Tools Course, Part I PMT 252 deploys Oct. 1, 2017. PMT 251 valid predecessor course until Oct. 1, 2018. PMT 355 (DL) – Program Management Office Course, Part A PMT 352A – Program Management Office Course, Part A PMT 355 deployed May 1, 2017. PMT 352A valid predecessor course until Oct. 1, 2019. PMT 360 (R) – Program Management Office Course, Part B PMT 352B – Program Management Office Course, Part B PMT 360 deployed May 1, 2017. PMT 352B valid predecessor course until Oct. 1, 2019. 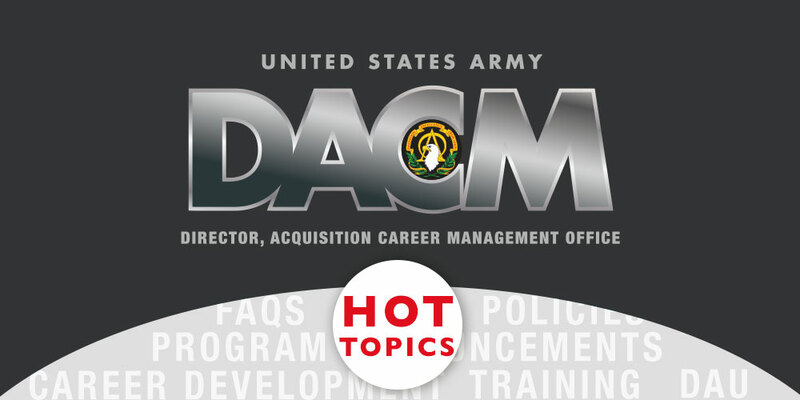 The next session of ACQ 404, the Senior Acquisition Management Course, will be held at DAU – Fort Belvoir 13-17. This course is limited to general officers and Senior Executive Service members only. The course focus will be “Sustaining Momentum – Pursuing Warfighting Effectiveness and Superiority in Uncertain Times” with selected topics on rapid acquisition, prototyping and fielding, as well as Section 809 acquisition reform and Section 901 Office of the Secretary of Defense reorganization. Key speakers include Hon. Ellen Lord, newly confirmed undersecretary of defense for acquisition, technology and logistics; Adm. John M. Richardson, chief of Naval Operations; and Ms. Steffanie B. Easter, acting assistant secretary of the Army for acquisition, logistics and technology. Register via ATRRS.